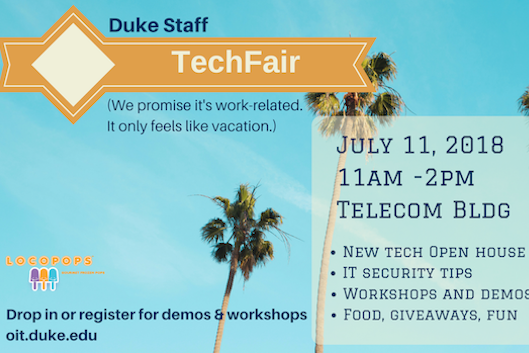 Join OIT & friends for an open-house style event featuring table-top demos and practical advice about Duke's most useful technology services. Participants may drop-in any time between 11-2 for food, demos, and prizes. A light lunch and Locopops will be served. Virtual Reality and 3D printing demos DO require registration. http://training.oit.duke.edu/reg. Drop-in 30-minute workshops do NOT require registration.